1978 built in the German Democratic Republic (GDR), the former east German. And although all the lables are in english, it was sold to the UDSSR mainly. There was also a version in the same look, but without the string section, named Vermona Piano. The note name lables on the keys and the little dots left of them are now gone. By using pure alcohol I was able to remove the so called permanet felt tip marker writing. It is build like most of the string machines from this time. A high frequency top-oscillator is divided into 12 freqeuncies that make up the top octave. Each of the 12 notes is then divided down by 2:1 several times to create the different octave found on the keyboard and in the footages of the different registers. All this is done with square waves. These are then mixed, filtered or shaped to generate the the sound. 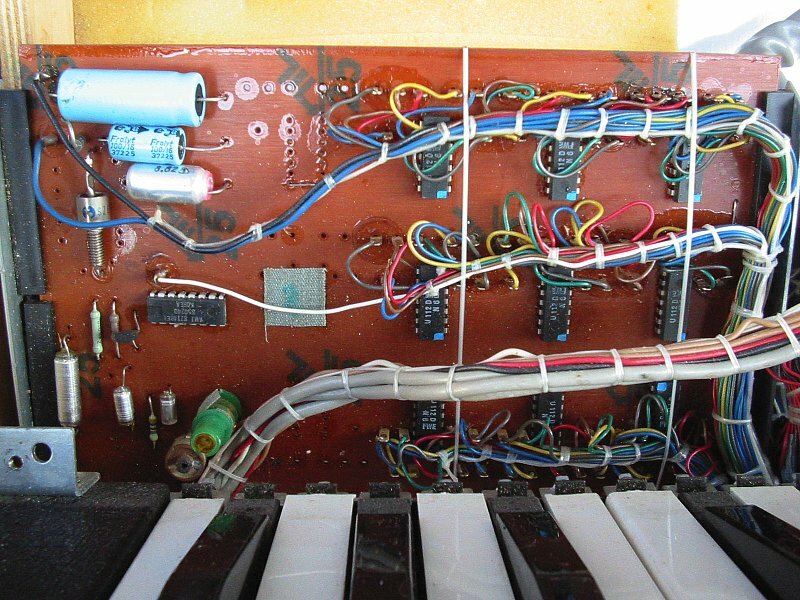 Yes, this is just like an typical organ keyboard. the multiple analog chorus unit. You can see it under the keyboard action in the picture above. The top oscillator and the top-octave divider ? The chorus modulation consists of 3 tca350-based indentically boards which are fed with the "dry" signal coming out of each section and controlled by three CV's which waveforms are identically but the second and third ones are out of phase of 120° and 240° respectively with respect to the first. This is virtually the same principle on which is based the famous chorus effect of the Solina String ensemble (and Eko Stradivarius) and most of the other string machines of the seventies. The CV waveforms consist of different combinations of a 0.6hz (slow) sinewave and a 6hz (fast) sinewave. Different presets for the modulation sections are available (4 for each section), and are selectable by pressing the eight corresponding switches on the left hand side of the front panel. In the unit I used to own were TDA1022s on a little additional subboard. It is not clear, if this was a substitude for a repair job, or done because of the lack of the TCA350. These analog chips are the very types as found in nearly all other string machines I got here. The blue flag under the instrument is an original flag of the "Junge Pioniere", a former east german youth organisation ruled by the goverment. The words in the flag under the flames of the torch translates to: "be ready". No this is history here in the reunited germany for more then 25 years. Read more about this part of the newer german history here.